Conor Cooney is expected to have fully recovered from a knock to line out in the Leinster Hurling Championship quarter-final against Dublin. The Galway senior hurlers, under team manager Micheál Donoghue and selectors Frannie Forde and Noel Larkin, kick off their 2017 championship with a Leinster quarter-final against Dublin in O'Connor Park (Tullamore ) on Sunday (4pm ). 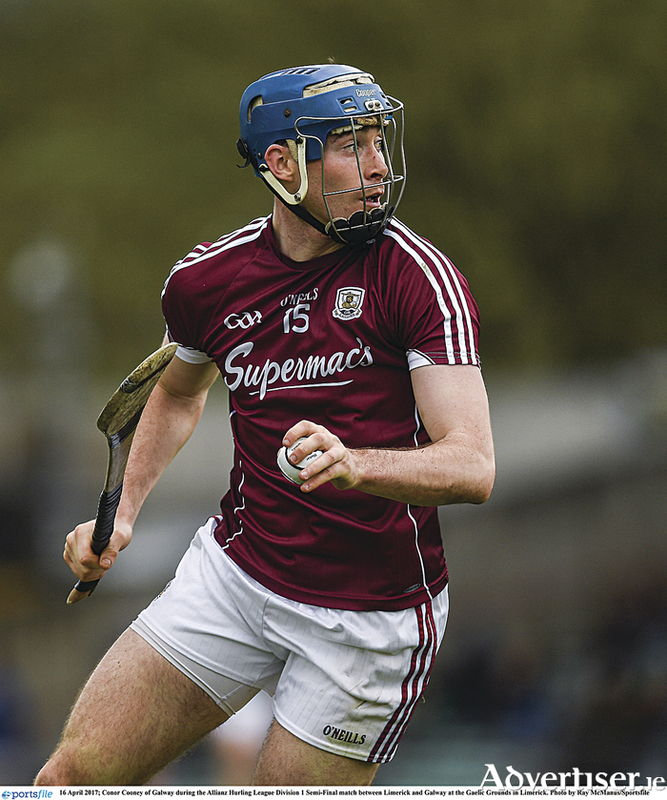 Following their good form at the end of the National League that saw them beat Waterford, Limerick, and ultimately emerge as league champions after defeating Tipperary in the final by 3-21 to 0-14, Galway are expected to be too strong for Ger Cunningham's side this weekend. The money men have Galway installed as 1/4 hot favourites with the metropolitans available at 7/2, and comhscór available at 12/1. However, last Sunday's terrific and high-octane success by Cork over hot favourites Tipperary in the Munster championship will have helped focus Galway minds on what needs to be done, and the type of performance required to move efficiently and effectively into the next round. Favourites are there to be taken down on any given Sunday, and that is what former Cork star Ger Cunningham will be telling his charges. Galway selector Frannie Forde knows Galway will need to be in the right frame of mind and to be right mentally for this clash with Dublin. "There is very little between the top five or six sides on any given day or in any game and physically all panels are in extremely good condition," Forde says. "What we need to ensure is that all our lads are 100 per cent right mentally for the challenge that Dublin will pose. And that is true for any day you go out in championship hurling. If you are not ready for the challenge, and ready to work your socks off for the duration of the game, you will be in deep trouble. "Our lads are in a good place. The majority came through their recent club games showing good form and in the main injury free. Conor Cooney still has a slight knock, but we expect him to be available for the weekend. Unfortunately Johnny Glynn has an injury and won't be with us this weekend. "However, we have a very good squad and we are happy with the deck we can pick from. Every county panel will be missing a few players here or there during the championship and that's just the way these things pan out. Teams just have to get on with it. And if one player is missing, that gives an opportunity for another Galway player to come in and stake his claim for a starting position. Thankfully we have a good strong panel and lots of guys are vying for positions and that is a real positive in our squad." While the win over Tipp in the league final was a good result, Forde, who teaches maths and business at St Raphaels in Loughrea, believes there is plenty of room for improvement and that will need to happen right through the championship campaign. "There are always things to be improved on. After every game. The lads in our squad are very talented, hard-working and ambitious hurlers and they are always striving to improve. And we need improve on an on-going basis. That's just how it is." Forde says while it was nice to win the league, it is now well in the past. "We moved on weeks ago from that campaign and we are now totally focused on trying to have a really good and productive run in the Leinster championship. "It is the nature of sport that you always look forward to the next challenge, rather than looking back, and our immediate challenge is Dublin this weekend. That is where we are at, and fully focused on. Forde says Galway has the "utmost" respect for Dublin and players such as Liam Rushe, Ryan O'Dwyer and Eoghan O'Donnell. "They have some really talented players. Ger [Cunningham] has brought in some new players this year and they are somewhat of an unknown quantity, but they have been selected on the back of some top-class underage and club performances, so we will be wary of them. "That said, we will be focusing on our own performance and trying to implement our game plan rather than trying to nullify theirs. Our job is to have the lads in tip-top shape physically and mentally for championship hurling, and then it is up to them to go out and perform to their best. "That is what we will be asking them to do on Sunday. We believe in them and they have to go out and produce a performance that is good enough to get us into the next round. It is that simple."